Now you can put the food where your fish are with this innovative magnetic seaweed clip. Using the magnetic clip and extension bar, you can now move your seaweed feeding clip to any desirable spot in your aquarium. 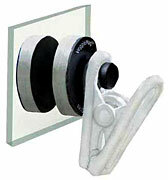 And unlike feeding clips with suction cups, the powerful magnet will continuously provide quality mounting support. The magnet also means it cannot be pulled off by your fish or moved around undesirably. It is powerful enough to be used on tanks up to 3/4" thick.